If you are a Player Studio creator for EverQuest II or have an interest in developing weapons, cloaks, or house items for EQ2, then you’ll be thrilled at the news that, next Tuesday, a free tool is being added to the EQ2 client to allow designers to get a better idea of how their creations will appear in-game. When 3D artists create these items in Blendr, Lightwave, 3D Studio Max, Maya, Zbrush, etc. the resulting geometry looks very different to how it looks in-game. This is due to the lighting and shaders which are unique to EQ2. The new Player Studio viewer app will, of course, not eliminate the need for 3D modeling software, but it will make it possible to see a close approximation of how items will look in-game, even at different times of day (affecting lighting and shadows). The new viewer is also going to open up 2 oft-requested new shader styles — Glow for self-illuminated items, and Alpha for transparent items. The Player Studio app will load FPX 3d files which are a common file format among most 3D modeling programs. PlanetSide 2 got this tool yesterday, and EverQuest will get their preview software in the first week of December. 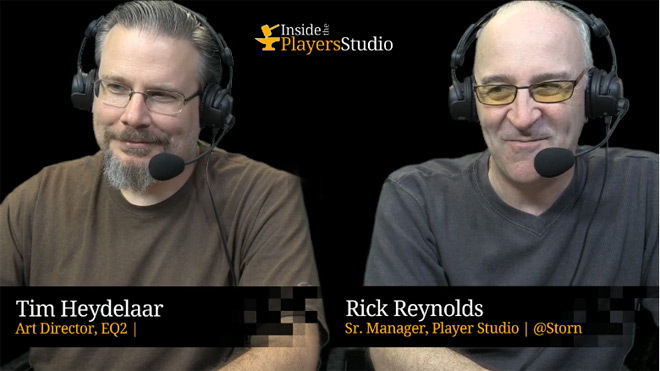 EverQuest II will get their Player Studio viewer app next Tuesday, November 25th. Thank you again Feldon. ^_^ I didn’t even know they had this live cast. Good stuff! If Tim reads comments afterwords, I thought the reaper and crow could of had more of I’m “alive” look to them for they look to statue like. I mean the eyes of the crow could of blink and the wings could of twitch with maybe the head swaying back and fourth. The fact they look to statue like was the biggest reason why I strayed from buying them, so perhaps in the future if something is animal or humanoid like that they have more alive affect? Even the eq2 player studio Seahorses have same lack of alive look to them. They should of had eyes moving and tail swishing perhaps up and down?